Police are searching for a taxi driver who slammed into the front of a building while attempting to flee the scene of an accident and then took off on foot. The taxi was involved in a minor accident with another vehicle in the intersection of Adelaide and Church streets at around 5:20 a.m. The man sustained a minor hand injury as a result of the incident but did not require hospitalization. “I asked him to stop but my hand was on his car and he dragged me all the way down,” he said. 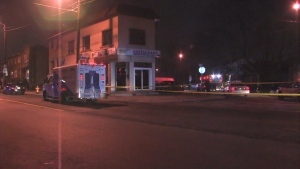 As the taxi attempted to flee the scene, it lost control and careened into the front of a chiropractor’s office located at 80 Adelaide Street East. That’s when the driver got out and fled the scene on foot. Police have told CP24 that they are not aware of any stolen vehicle reports involving the taxi. No suspect description has been released at this point. 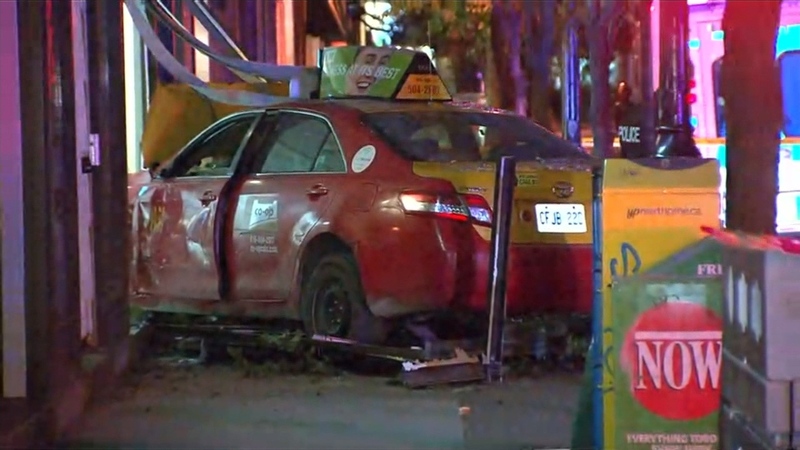 A taxi that slammed into a building on Adelaide Street East early Thursday morning is shown.